I get that question a lot and know why it happens. So, what did I do? I kill my baby echeveria in an indoor container (with a drain hole). I know better than to water in winter (or much). And there I go, dribbling in the tiniest bit of water. Bang: two days later it was dead. Daphne explains what’s often at fault: overwatering combined with lack of sunlight. “If the plants are not receiving enough sunlight for photosynthesis, they aren’t growing; and if they aren’t growing, they aren’t using water,” she says. Cautious watering is especially important in non-draining containers, since there’s no place for it to go. I wouldn’t mind some water outside, though! Still, my recently dramatically pruned Salvia microphylla ‘Hot Lips’ popped its first flowers. The ground’s so dry it’s hard to pull out my nemesis, hedge parsley or beggar’s lice (Torilis arvensis). When we had a cocker spaniel, it was a mess when he collected its sticky seed heads in his curly fur. Its long taproot, giving it another moniker “false carrot,” doesn’t make it easier to pull in no-rain soil. I don’t consider cute little henbit a pest, since its flowers attract tiny pollinators. And its seeds don’t stick to my socks and gloves! This week, Trisha explains how “weeds” can tell you a bit about your soil. Henbit, purslane and pigweed are signs of healthy, balanced soil. Dandelions and sow thistle have deep taproots that aerate and make minerals available to surface plants. If you don’t pull or cut weeds before they seed, you’ll have them for years in the seed bank (like wildflowers). Herbicides are not the answer. Instead, Trisha puts these greenies to work in a nutritious weed tea to naturally nourish your plants. Here’s the recipe. And here’s Trisha’s yummy weed pesto recipe. To spice up foliar entertainment in rocky, well-drained soil, what about Daphne’s Pick this week: American or Texas smoke tree (Cotinus obovatus). As a specimen tree, it’s a striking contrast against Pindo palm, yellow Bird of Paradise (Caesalpinia gilliesii) and Euphorbia rigida, here in Valerie and Kirk Walden’s garden. Although it can get to 15-30 feet tall, Kirk wanted to keep it shorter rather than block their outstanding view. In December, Julie Clark from Stronger Than Dirt cut it back 6’ for a current size of 6’. In my east Austin soil, I get my burgundy fix with Billbergia x Rubra bromeliad. Winter annual bee-loved calendulas, perennializing narcissus, and chervil dot this view. Red veined sorrel is pretty. . .tasty. So is Flashy Trout Back lettuce. I’m into burgundy. But you know what’s on our minds: summer tomatoes, peppers and other hot weather yums. Randy Thompson from Sunshine Community Gardens joins Tom for his short list of tried and true varieties and tips for success. You can get them all, along with herbs and companions at the annual plant sale March 5! With this crazy weather, be ready for anything. Viewer Picture goes to Bell County Master Gardener Rowena Fengel for her bearded iris blooming Christmas day. Since events abound, go ahead and mark it now: the Austin Funky Chicken Coop tour on March 26. 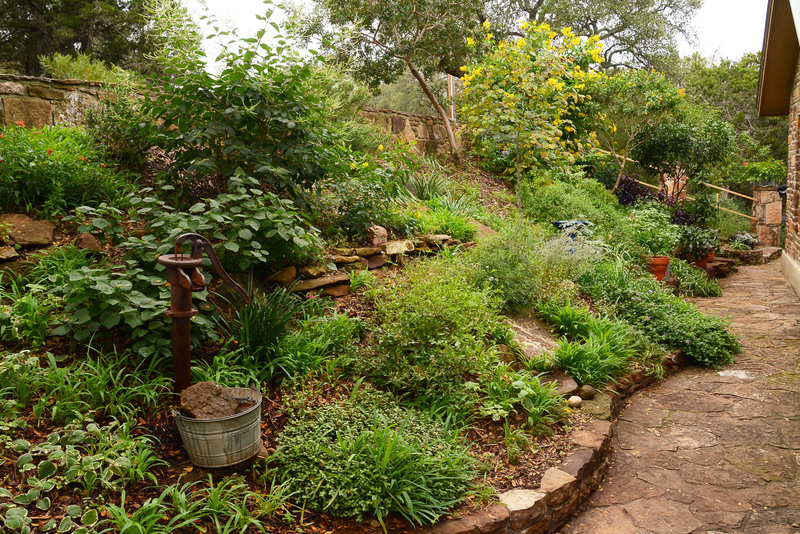 A few years ago, we visited Dani and Gary Moss in their artistic, wildlife-abundant garden, complete with Chicksville chicken coop. From recycled finds, they built a charming conservatory. The bottom stones came from their rocky property. When Dani decided to become a mom to chickens, Gary built Chicksville. See the whole story now!